I am up in Woodstock at my friend Joey’s house. While we were eating lunch, we planned dinner. Inspired by a new soup terrine, we decided to make this bean soup out of fresh ingredients and items in the pantry. Creamy from the cauliflower and potatoes and topped with pesto, this soup was a home run! Chop the onions, carrots and celery and mince the garlic. Heat olive oil in the bottom of a big soup pot and sauté the onions with a dash of salt until translucent. Add the carrots, celery, garlic, and another dash of salt and sauté until softening. Chop the cauliflower and potatoes and add to the pot. Pour in the vegetable stock and bring to a boil. Reduce to a simmer and cook until the cauliflower and potatoes are soft. Use an immersion blender or blender to puree the soup. Pour back into the pot. Drain the beans and add to the soup bringing up to heat. Combine all ingredients in the processor and combine until it looks like pesto. 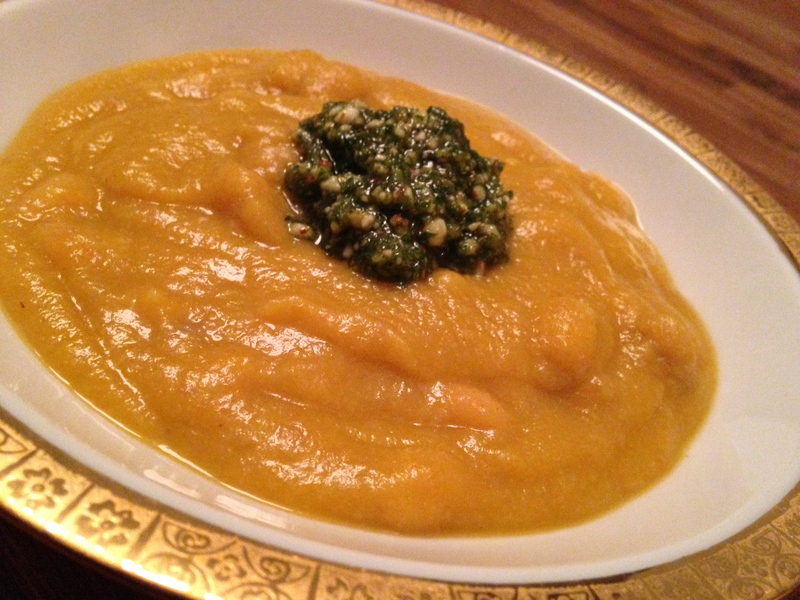 To serve, ladle the soup into a bowl and top with a dollop of pesto. Enjoy!